A week later, I’m still thinking about the baseball game Zachary and I went to last week in Memphis—not so much because of the poorly played game (can’t anyone in this league execute a run-down!?! ), but because of the group that sat in front of us in the stands. They were tourists from all over the UK who were taking an American holiday via train. Baseball, they decided, would be part of their experience. The only problem is that they did not know the first thing about baseball. I explained the action the best I could, deferring occasionally to my son. I have been a baseball fan for more than thirty years, so long that its rules and strategies are second nature to me. I had no idea how difficult it would be to put what I know into words. The experience has made me consider other things that exposure and practice have taught me to take for granted—riding a bicycle, for example, or speaking English. Or living as a Christian. It’s not that I do any of these things recklessly or without thinking. It’s simply that I do them without the need to narrate to myself what it is I’m doing. On occasions when I need to talk through it for the sake of teaching someone else—“Okay, now push down on the right pedal while keeping your balanced centered over the bicycle. Shift gears. Breathe.”—I’m sure I sound like an idiot. Amazingly enough, however, our international evening at the baseball game turned out to be fun—and not just for me. The travelers from the UK thanked me and Zachary for guiding them through. “It’s so much more enjoyable when you have some idea of what’s going on,” one woman said. So why did it work out, despite their lack of understanding and my difficulty in verbalizing the action? Certainly not because I made the game simpler for them, try though I might. The truth is that the complexity of its execution is just as much a part of baseball’s beauty as grace and skill of its athletes. Things that are complex can also be beautiful, even if they can’t be simplified. We do not need complete understanding in order to appreciate what is happening. But we do need a guide—someone to help us see the difference between chaos and complexity, to not only explain but to stand with us in wonder. Last night, I dropped everything to go to a minor league baseball game. It was an act of self-defense, really. A semi-conscious realization that I had pushed too hard for too long, worked too many hours with too little sleep for too many weeks. If I wanted to maintain any kind of healthy balance, I had to get away from the temptations to keep working on one thing or another. Baseball was (and usually is) my refuge. As we crossed the bridge into Memphis, my son let out an enormous breath. He gasped for air like a swimmer just surfacing after too long under water. He explained to me that one of his friends had taught him this game. You hold your breath as you cross a bridge. If you make it to the other side without inhaling, you get to wish for something. “Daddy, have you played that game?” he asked. On the way home, I upped my speed a little bit. Zachary had forgotten about the game and was busy inspecting the batting practice ball he’d found under his seat. I, on the other hand, was holding my breath. When I play this game—and that is far more often than anyone my age should be able to admit—I almost always wish for one of two things: clarity or opportunity. Like many who follow a spiritual vocation, I often find myself in murky waters, surrounded by plenty of life but also plenty of danger. Sometimes it’s hard to tell which way to turn. Even when I have a good idea of where I should end up, I can’t always see how to get there. And so I hold my breath as I cross bridges and wish for clarity and opportunity. I want to know what to do, or at least to know what is really going on around me. And I want as many chances as possible to impact the world in which I live for the good. Simple enough, right? Well, yes. And no. Like I said, I live out my vocation in a thick swirl of complexity. Just when I thought Zachary had forgotten all about the bridge game, he asked another question. I laughed and told him that was good and wished for the billionth time that the things I often seek were so readily found. They are not. They are more than wishes for me. They are prayers. And only occasionally are they answered. Still, every now and again, I glimpse them, even though I cannot grasp them. And I am thankful for the glimpses when they come. They are enough to bring me back to my senses, to point out to me that I’ve been holding my breath in waiting, and it’s time to breathe again. On a rainy Monday last November, my two boys joined me at work while Denise ran some errands. Ever mindful of the destruction our children can wreak on my office in virtually no time, she sent them to me with a packet of bulbs and instructions on where and how to plant. I set the boys to work. Half an hour later, we had three bulbs in the ground, and I was working alone. And so it goes. But we had started the project, and the bulbs were worthless unless buried in soil, so I went ahead and buried the rest, six inches apart and four inches beneath the surface. Then I went inside to check on the boys and forgot all about them. Forgot, that is, until I went to mow the lawn at Wesley last week and noticed some odd looking weeds spaced evenly along our east wall. Thankfully, I remembered what they were before I hacked them down with the mower. 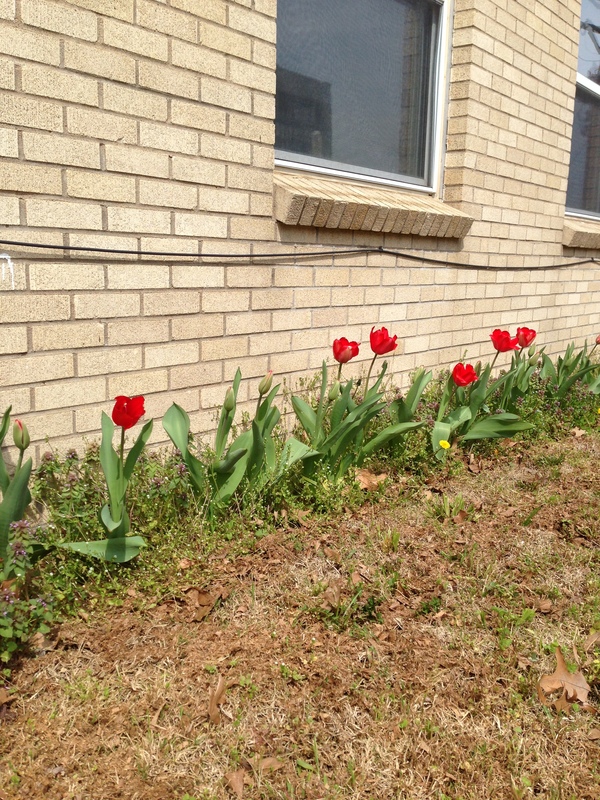 This morning, I found the tulips in full bloom, and in A-State red, no less. It seems that even forgotten seeds still grow. Last month, I read Doris Kearns Goodwin’s Team of Rivals: The Political Genius of Abraham Lincoln, which details Lincoln’s political successes with a constant eye toward his personal character. One of the most startling things to learn is how his refusal to hold a grudge or even be angry at a personal slight bore invaluable fruit for both him and the nation in later years. Despite the snub, Lincoln stayed in Cincinnati to watch the trial. Through the proceedings, he became an admirer of Stanton. More importantly, however, Lincoln held his tongue, not willing to make an enemy over something so trivial as a personal insult. Lincoln’s charity paid off less than a decade later, when he asked Stanton to serve as his Secretary of War in the struggle with the Confederacy. Stanton’s leadership played a vital part in the Union victory. When Lincoln was assassinated in 1865, it was Stanton who tirelessly organized the manhunt for the killers. When I think back on my own formative relationships, I see a fair number that began no better than Stanton’s with Lincoln, with dislike and derision and perhaps even insults. I have no way to gauge how many friendships I lost because of that initial unkindness, but I can see very clearly how a little tolerance and understanding made room for an important connection. Perhaps the tulips at Wesley and the story of Lincoln and Stanton are a good reminder. The way we treat people sticks with them, whether for good or ill. When we live with mercy and selflessness as our habit—behaving the way Jesus might—we likely will not remember all the good things we do or bad things we neglected. No matter. Opening Day 2013, and the world in my home looks happy to greet it. It seems to me as good a time as any to restart Monday’s Penny. I’ve spent the past several months with my head buried in a novel I’ve been writing, which has occupied virtually all of my spare time. Now that the novel is in a workable form, it’s time to return once more to other writing projects, including the blog. To tell the truth, I’ve been hesitant to work on Monday’s Penny again, for two reasons. One is that I’d made a commitment to myself to stay relentlessly positive and to avoid talking about church politics as much as possible (and yes, those things are related). I felt I was doing a poor job with resisting the temptation, and looking back over previous posts, I think that’s a valid bit of self-criticism. But the bigger reason is that I fell victim to a sort of self-doubt that plagues writers (and more reflective preachers) across the globe. I began to wonder if I had anything to say that was really worth saying. It seemed that others were doing a perfectly adequate job of dealing with the humor and complexities that make life really interesting. What did I have to add to that conversation? Certainly nothing new. Then I went back and re-read Annie Dillard’s Pilgrim at Tinker’s Creek, and I remembered why I started this project. It was not to say grand things or break new ground. It was simply to call attention to bits of everyday goodness and wisdom that we might otherwise have missed, like a penny in the parking lot. It’s easy enough to forget the penny was ever there if you hurry on past it. But if you take the time to pick it up, you might discover a surprising treasure. Even though I haven’t been writing for the blog lately, I’ve still been collecting pennies. I feel sorry for them in a way. No one counts them of much value, which is why they’re so abused. But try to buy a soda and a package of sunflower seeds at the convenience store near my office with only two dollars and a quarter. The register will ring $2.26. The attendant doesn’t flinch, and there is no take-a-penny tray in this establishment. That one forgotten coin you almost neglected turns out to be the difference in your diet, if not your day. When we—writers, preachers, poets, or anyone else with a leaning toward creative expression—prejudge our work and stop ourselves from creating it, we leave our ideas laying on the pavement, ignored and soon to be forgotten. But who knows when one of those pennies will turn out to be just the thing? Our insights and experiences, however limited in value in the harsh eyes of a critical world, are the currency of human interaction. We hoard them at our own peril.